One of the most important aspects of finding success in any business is to keep overhead costs low while maintaining high levels of efficiency. By saving time in performing routine tasks, your organization can increase revenue by cutting operational costs. Automating your routine forms, workflow processes and business procedures is one of the best ways of simplifying business process management and boosting productivity. Efforts to streamline workflow and optimize processes will yield cost savings and more accountability across your organization. PerfectForms offers unique business process automation solutions for organizations of all sizes. The ability to make use of existing templates or create customized workflow applications makes this a flexible workflow automation software solution. Automation of business processes helps to reduce time in performing tasks in order to keep costs low while driving revenue up. When in search of the ultimate tool for workflow analysis, design, diagramming, mapping, rules and reporting, PerfectForms is the ideal choice. The secret to the success of PerfectForms is simplicity. Without any coding knowledge, employees can create and deploy complex workflow applications that can streamline operations on any level of your organization. In just 3 simple steps, these applications can be hard at work for you, giving you the utmost in productivity. Not only is PerfectForms workflow automation software simple, but it’s also powerful. Advanced reporting, intuitive interfacing, and versatile applications make this the best solution for any business. 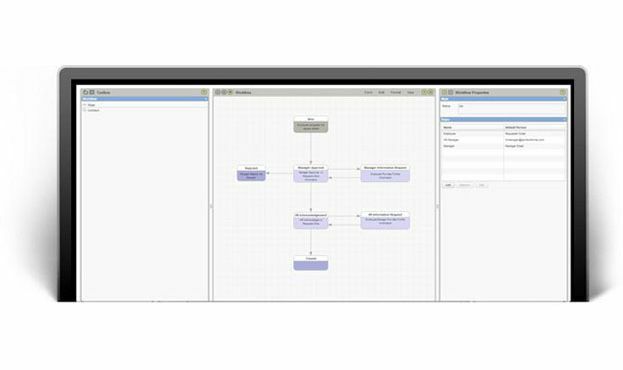 With a simple, visual workflow designer, it is easy to layout your workflow and ensure compliance at each workflow step. PerfectForms puts you in control of your business. With hundreds of templates to address processes in human resources, finance, sales, and more, it’s easy to transform your business with PerfectForms. Easily ensure compliance with your internal business procedures and workflow approval processes in every department. Contact us for more information about the many ways this business process workflow automation software can improve your business.